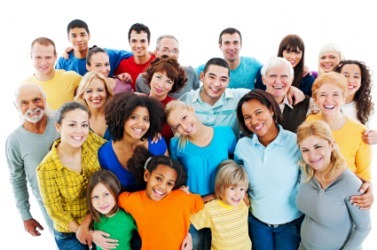 People are those belonging to a place, religion, nation, race, language, class or culture. An example of people is those living on the east coast. An example of people is Christians. An example of people is Italians. An example of people is Caucasians. An example of people is Spanish-speaking. An example of people is wealthy. An example of people is vegetarian. "people." YourDictionary, n.d. Web. 21 April 2019. <https://www.yourdictionary.com/People>. the members of a group under the leadership, influence, or control of a particular person or body, as members of a group of servants, royal subjects, etc. Fr peupler < the n.
a. Humans considered as a group or in indefinite numbers. Often treated as a plural of person, alone and in compounds: People were dancing in the street. I met all sorts of people. This book is not intended for laypeople. a. A body of persons living in the same country under one national government; a nationality. b. The citizens of a political unit, such as a nation or state; the electorate. Used with the. pl. peo·ples A body of persons sharing a common religion, culture, or language: the peoples of central Asia. a. Persons with regard to their residence, class, profession, or group: city people; farming people. b. Persons subordinate to or loyal to a ruler, superior, or employer: The manager would like to introduce you to our people in the regional office. c. A person's family, relatives, or ancestors: Where are your people from? Informal Animals or other beings distinct from humans: Rabbits and squirrels are the furry little people of the woods. To settle or inhabit with people; populate. Used as plural of person; a body of human beings considered generally or collectively; a group of two or more persons. (plural peoples) Persons forming or belonging to a particular group, such as a nation, class, ethnic group, country, family, etc; folk; community. A person's ancestors, relatives or family. My people lived through the Black Plague and the Thirty Years War. The mass of a community as distinguished from a special class (elite); the commonalty; the populace; the vulgar; the common crowd; the citizens. To stock with people or inhabitants; to fill as with people; to populate. (intransitive) To become populous or populated. To inhabit; to occupy; to populate. From Middle English peple, peeple, from Anglo-Norman people, from Old French pueple, peuple, pople (modern French peuple), from Latin populus (“people"), of unknown origin. Probably of non-Indo-European origin, from Etruscan. Gradually ousted native Middle English lede, leed (“people") (from Old English lÄ“ode). Originally a singular noun (e.g. The people is hungry, and weary, and thirsty, in the wilderness --2 Samuel 17:29, King James Version), the plural aspect of people is probably due to influence from Middle English lede, leed, a plural since Old English times (compare Old English lÄ“ode (“people, men, persons"), plural of Old English lÄ“od (“man, person")). See also lede, leod. A group of persons with common historic, linguistic, national, racial, religious, or traditional ties. There are three basic types of people: those who can do math and those who can't. Most people will tell you anything you want to know. I made friends with many people on the train. When she talked to people, she liked to do it face to face. People passing between them were a blur. Mom used to say that people suspected in others what they had experienced or what they would do in the other person's shoes.